Ballots are counted during the 2010 general election. WASHINGTON—The United States and Canada on Wednesday announced they will send election observers to parliamentary by-elections in Burma scheduled for Sunday. However, they insisted that the even though the Burmese government's invitation was a positive move, it still had not met international standards in this regard. The United States said it is sending two individuals, Peter Manakis from National Democratic Institute (NDI) and Johanna Kao from International Republican Institute (IRI), as per the invitation from the Burmese government. In Ottawa, Foreign Minister John Baird announced he was sending Senator Consiglio Di Nino and Parliamentary Secretary Deepak Obhrai to Burma to witness and report on the parliamentary by-elections. 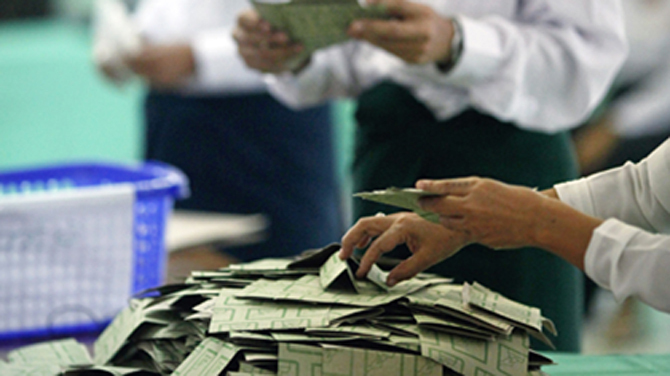 “These by-elections are the latest tests of commitments made by Burmese authorities to real reforms. Canada and the world are watching,” Baird said. For the April 1 by-election, Burma invited each member and dialogue partner of the Association of Southeast Asian Nations (Asean) to send a small delegation to witness the voting. “We expect these elections to be free and fair. We will base future actions on whether we see progress in developing a more open, just and prosperous society,” he said. “Our witnesses will carry with them the hopes of all Canadians that these elections are conducted peacefully and produce results reflecting the will of the Burmese people,” Baird added. The US State Department spokesperson, Victoria Nuland, told reporters at her daily news briefing that the US election observers will be in Burma from March 28 to April 3 to study the conduct and significance of the polling. “But as they said in their own statement that they released yesterday, they will not be in a position to monitor in the traditional sense under the terms of the UN Declaration of Principles on International Election Observance, because they’re only getting there a couple of days before the election,” she said. In a separate statement, NDI and IRI said its election observers will not conduct a traditional election observation of the by-elections, since such a mission would require adherence to the Declaration of Principles for International Election Observation, which was launched at the United Nations in 2005. “So the process that the Burmese have offered, although a positive advance over past elections, is not going to conform to international standards for conducting an election observation mission,” Nuland said in response to a question. Nuland said the expectation is that the NDI and IRI representatives will link up with their colleagues from Asean, many of whom they’ve worked with before, and try to make sure that we’re getting as much coverage as possible during the elections. “In addition, we’ll have some of our embassy folks, and we will work with the Asean embassies as well to make sure that we don’t duplicate and we get as much coverage as we can,” she said.